I’m sitting in my blue chair listening to Johnny Cash cover One (originally by U2). Look it up if you haven’t heard his rendition. It’s fantastic. It’s Monday, and that means a Monday Blog. I thought today I’d share the first of three pieces I wrote for the online class I’m taking: How Writers Write Fiction. The first week of the online class was Welcome Week, and there were three assignments to get the creative juices flowing. In the first assignment bringing an everyday object to life. 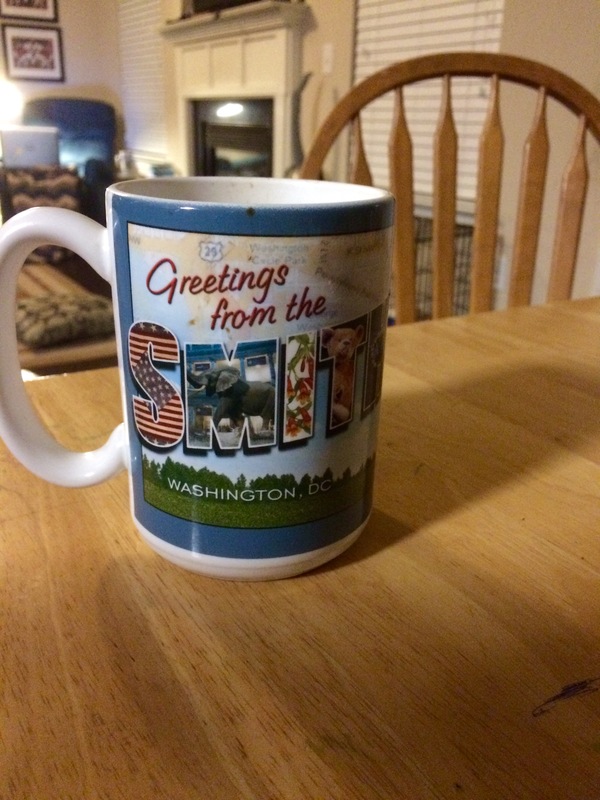 I chose the Smithsonian Mug. I chose this mostly because I love coffee, and I drink out of this mug almost every day. It’s my favorite (sort of like my snowman pajamas). I sit on the center of the shelf. All the others surround me. I am the prized possession. The one she always reaches for first in the morning. I sit up tall, proudly displaying the words We Can Do It! of a suffragette woman from long ago. She calls me the Smithsonian mug, named after the place I was born, where other mugs like me lined the shelves, my sisters and brothers in ceramic. The images printed on my body proudly display historical images of this land where we live. My grandfather, faded from too many cycles, has been pushed to the dank, dark, back of the cabinet. I can see the crack of light seeping through the seam in the cabinet door like a ray of light, but is he left behind to languish in disuse. Every time the doors open and she reaches her hand in, I stand up a little taller, hoping to be picked. I am like a child calling out pick me, pick me to the captain of the team during P.E. I am the popular one, and my fellow mugs are the ones who are always picked last. My print is fresh and unspoiled. I look back at Grandpa mug, hanging his head low, hoping to be put out of his misery, transferred into a brown box and sent off somewhere as others have gone before. We simply call it going to the box. No one knows where you go after you leave this place, this house, the world directly beyond the cabinet. Red Tall Mug said The Man took him in a car one time. But she, The Woman, only drinks from me in the morning while sitting in the blue recliner, typing away at keys on a black box. Red Tall Mug says the world is vast and more beautiful than we could imagine. But I am content, being filled with coffee and a splash of milk, and sitting cradled in the palm of her soft hands as she continues to pick me to provide her with the kind of creature comfort only I can provide. Did you know The Devil Within ebook is on sale until October 17th! Pick up your copy on Amazon: http://amzn.to/1QU3axK. ← The Devil Within is $0.99! I like the assignment. It’s a good way to get the writer to think outside the box. I may try that for a flash fiction story. George–I thought it was so much fun! Not something I was used to doing either. Love that Johnny Cash cover.